description for "Peanuts: Arachis hypogaea var. 'Early Spanish'"
'Early Spanish' is a splendid peanut variety even for northern locations, because it is early and prolific. Seed planted early in May ripens a crop in September. Let the kids try them, it will not only give them lots of fun but provide peanuts for the winter months. Instructions included. 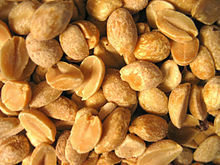 Days to maturity: 100.
reviews for "Peanuts: Arachis hypogaea var. 'Early Spanish'"